The ground is greening up with grasses and the leaves of familiar wildflowers around my house. I spy new bright green tips dotting the conifers on my trail runs and dog walks. It smells good – mountain spring. From my office window, I can see a not-too-distant ridge, white with snow thanks to that recent storm. Neighbors covered their planted flowers with buckets because pretty domesticated plants can’t take the abuse of mountain spring. Our native plants (read: weeds) are tough. They can survive the harsh and fickle changes in weather. Yay for natural (read: lazy) landscaping! 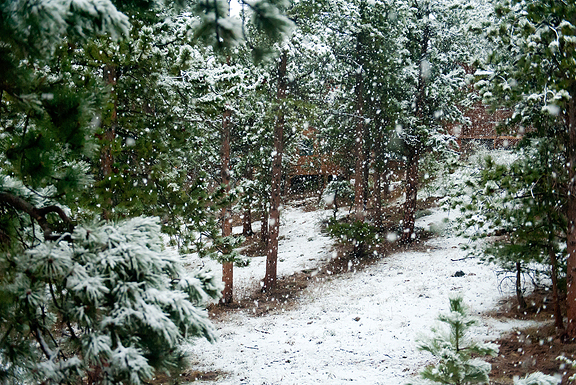 By the time we melted out last spring, it was summer. I live in the mountains, but shop for groceries down on the flats. So when I though it was finally springtime, most of the spring produce had come and gone and I had missed out. Not so this year, and I was quick to pounce on English peas when I found them. They are so green, so spring. I’ve never been a huge fan of peas. 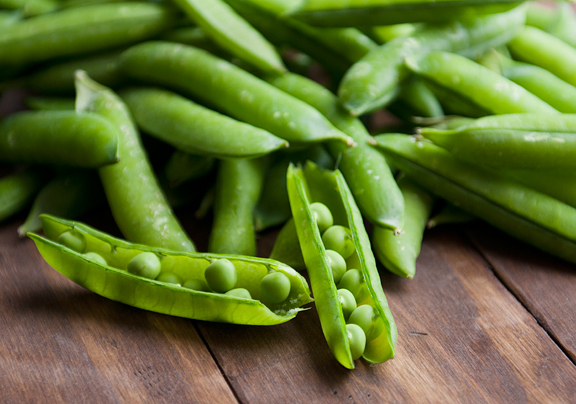 Snow peas and sugar snap peas, sure, but not English peas unless they were cooked to death in soup. Over the past few years they’ve grown on me as I’ve had them prepared in ways that emphasize the freshness and the sweetness. Also, I like shelling them more than anything else – something mindless to do while lost in thought. 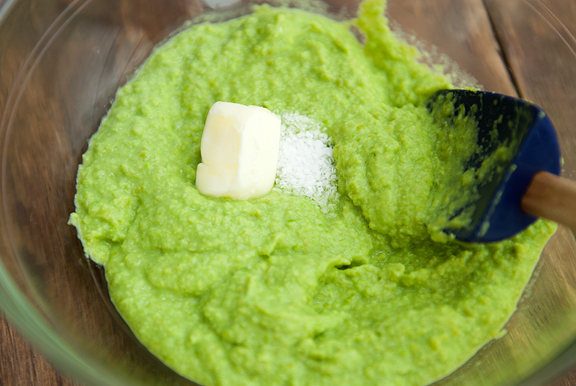 My intent was to make a pea purée that I had bookmarked on my friend, Chris Cina‘s blog. But I wanted to pair it with something different. 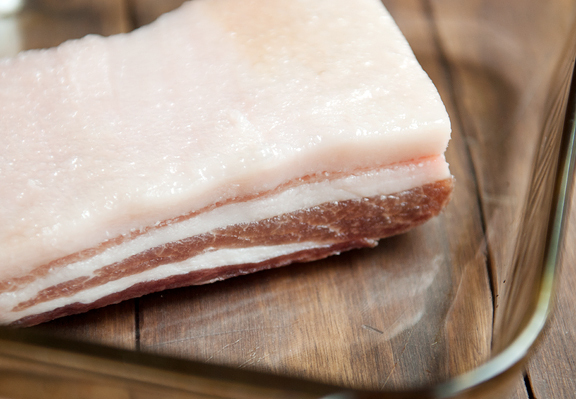 Pork belly is the starting point for precious bacon, but pork belly itself is pretty wonderful noshing. You (we) see it on restaurant menus all the time around here, so I wanted to roast some pork belly at home, to gauge if it was something worth putting on our menu for dinner guests. 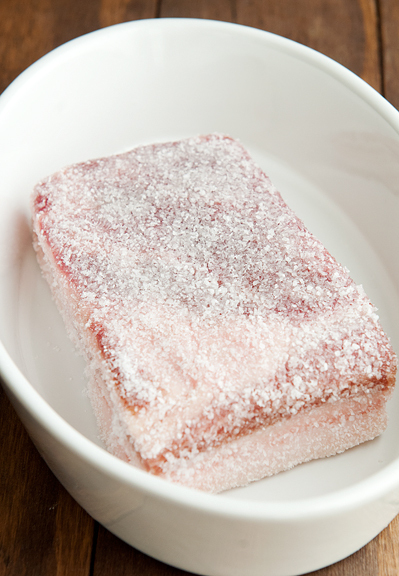 I had a straightforward recipe bookmarked (it’s been on my mind for a while) and stripped it down to just a salt and sugar curing mostly because I didn’t have the other ingredients on hand. While the pork belly was roasting away in the oven, I busied myself shelling the peas to prepare the pea purée. It’s quick to do. Prep the ingredients, sweat the garlic and shallots in some butter. Then you pour in the wine and stock with the peas. 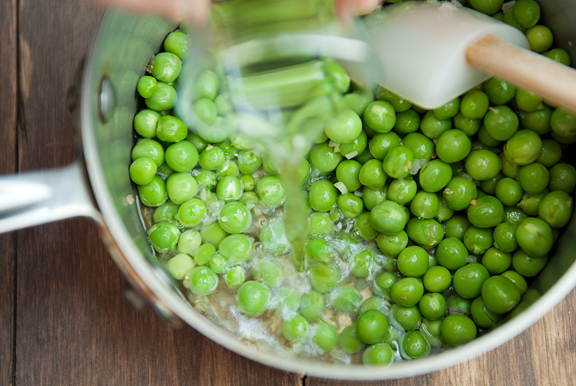 Bring it to a boil and simmer the peas until tender. Such a lovely shade of green. Now, I should note that this was made before I got my Vitamix. I puréed the peas in my old blender, which does a pretty poor job of… well everything. The purée wasn’t as smooth as I had hoped, but next time I’ll be using my Vitamix and those peas better watch out! Okay, so how was the pork belly doi- ahhh! I basted it during the one hour of high-temperature roasting, but I assumed it wouldn’t have problems during the two hours at 250°F. The top had bubbled up and burned, but thankfully the meat was fine. I probably should have checked on it during those two hours as the piece of pork belly was a quarter the amount in the recipe. Now I know. I took it out of the oven, sliced off the overly burnt sections, and prepared it for dinner. 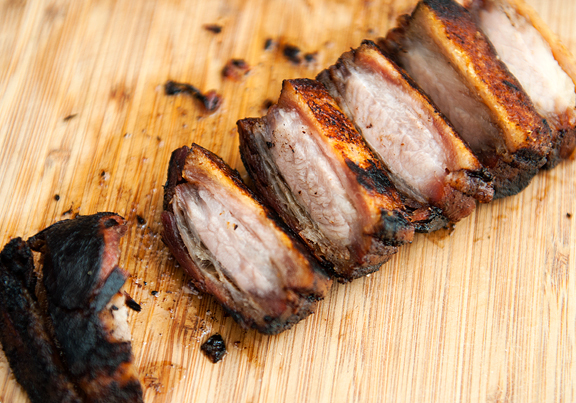 The pork belly is so good, you’ll be hard pressed not to eat it up on its own before it hits a serving plate. But I did resist and I managed to save enough pieces to nestle onto a bed of pea purée. Since I had made this the same day I made those nifty fried fennel slices, I dropped a few fennel fans on the side. Next time? BIGGER piece of pork belly. I am convinced that savory, salty, porky goodness would go with anything, but it is extra delightful with the sweetness of fresh spring peas. Mix the kosher salt and sugar together. 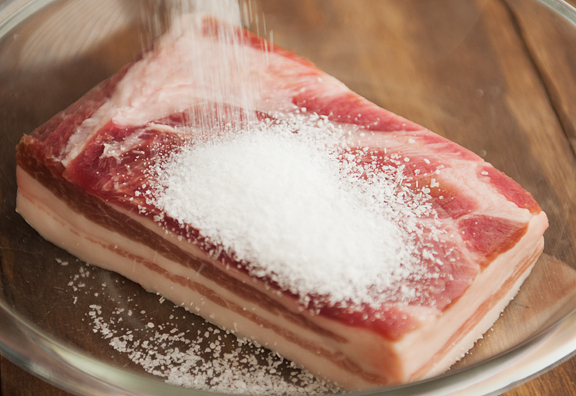 Rub the salt-sugar mixture all over the pork belly until completely coated. Discard any excess. Place in a dish and cover with plastic wrap. Refrigerate overnight for up to 12 hours. 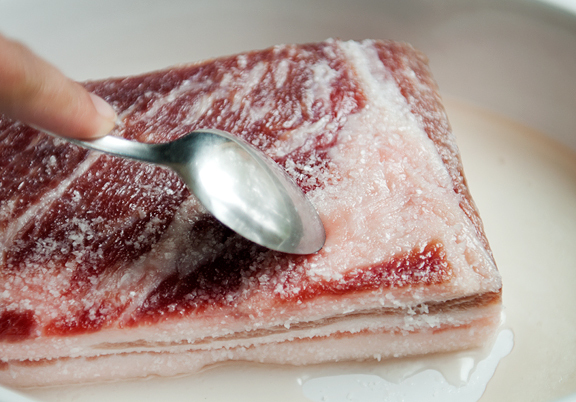 When the pork belly is ready, preheat your oven to 450°F. 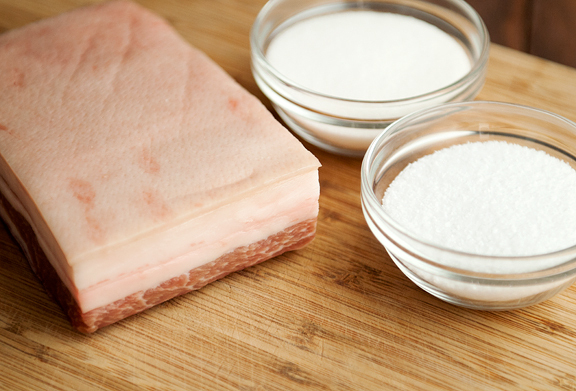 Remove excess cure from the pork. 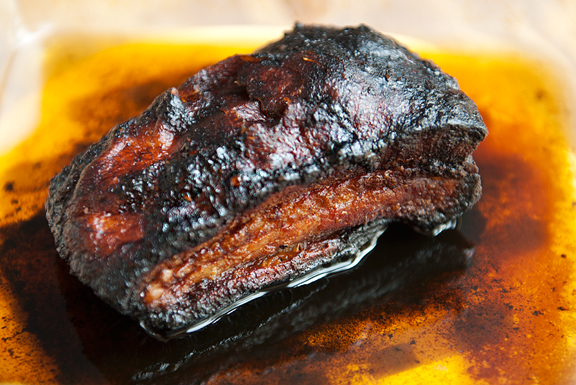 Set the pork belly on a clean baking dish and roast for an hour, occasionally basting it with the pan drippings. Lower the temperature to 250°F and continue to bake for 2 more hours. It should be golden brown. Slice. 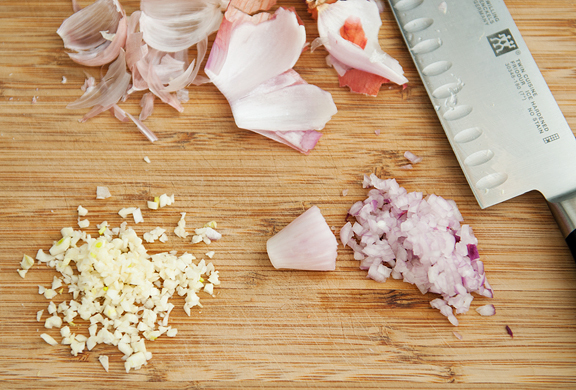 Melt a tablespoon of butter in a small saucepan over low heat and sweat the shallots and garlic. 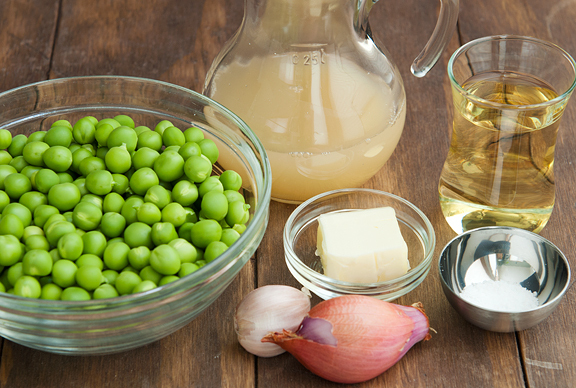 Add the peas, wine, and stock (or water) and increase the heat to high. 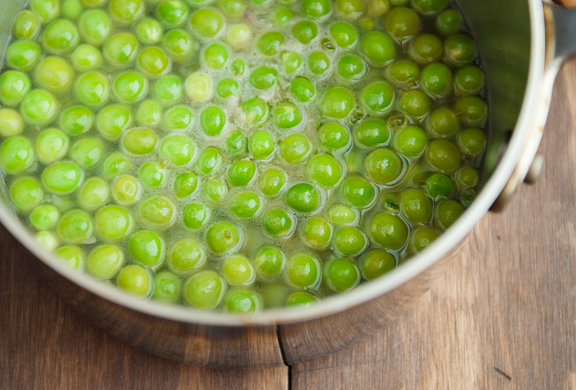 Bring to a boil, reduce heat to medium and let simmer for 5 minutes or until the peas are soft. 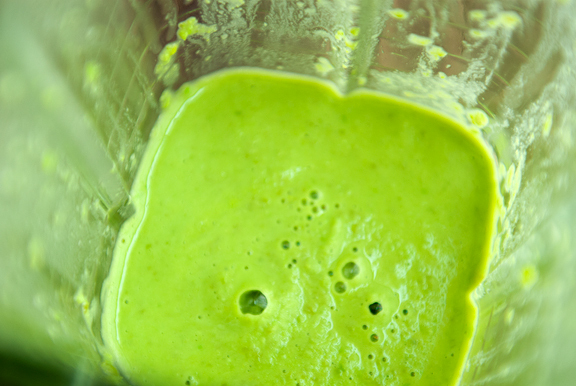 Remove from heat and purée everything (in a blender or food process or using an immersion blender) until it is smooth. 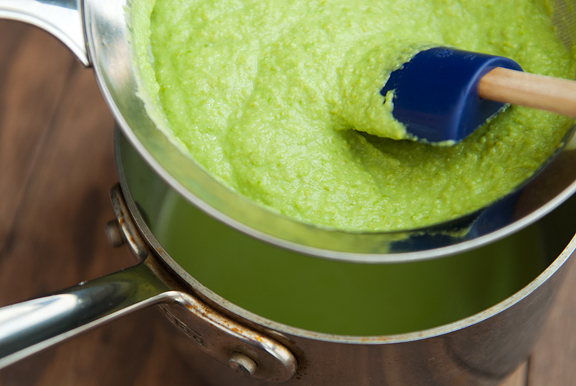 Strain (discard or drink the liquid) and stir the butter and salt into the pea purée. To serve: Spoon purée onto serving vessel and set slices of pork belly on top. Weeee! This looks amazing! 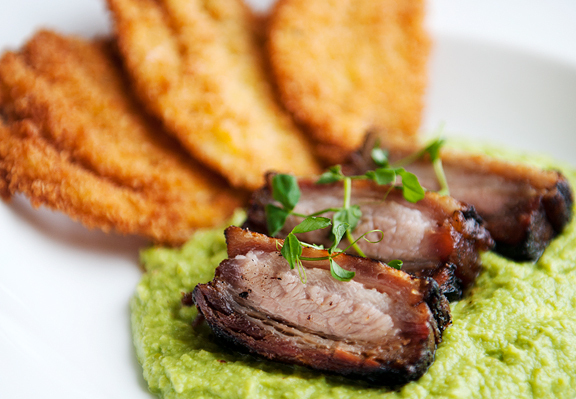 I need to figure out where I can get pork belly…bet it pairs amazingly with the pea puree! You just made hotel chefs look silly. This looks CRAZY delicious! Wow. The marbling on the pork looks incredible. Yes. I’ll one of those, please. the game in Colorado is amazing! My mouth still waters when I think about the elk burgers I had in Denver. So, so good! I don’t think I could’ve resisted the temptation during plating. Had it been me, half the pork belly would be gone by the time dinner is served. TPH would gobble this up….I’m not so sure. I’m leary of stuff like that. But those peas!!! Yum Yum Yum. sara – I got mine from Whole Foods. William – I know, right? 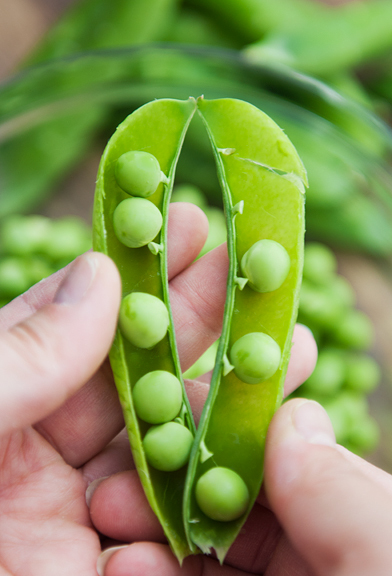 jennifer – yeah, not everyone is sold on peas, but fresh peas are SOOO GOOD! bob – thanks for the tips! Jill – I’ll keep that in mind next time you guys come up for dinner! 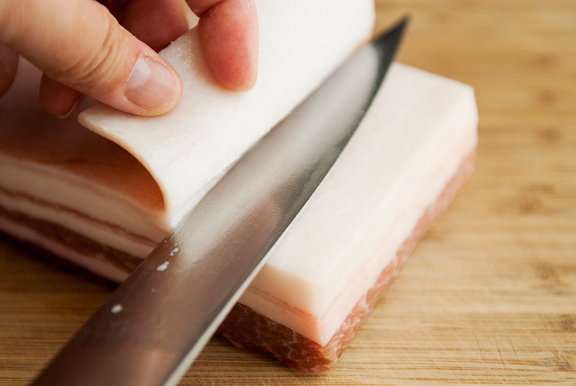 I have the privilege of making pork belly often…try leaving the skin on next time. During the braising/roasting, the skin becomes soft and unctuous…positively something to swoon over.